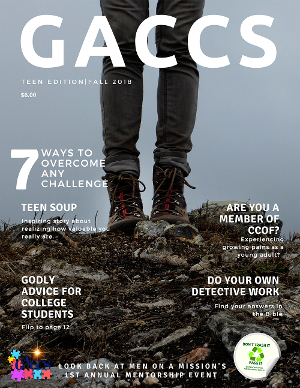 GACCS Teen Magazine premiered with its first edition in October 2015. God Almighty Christian Counseling Services has always provided outreach to young men and women and what started as an article for a newsletter has turned into a 30+ page magazine that is filled with inspirational, thought-provoking good news with hopes to help young adults to stay focused on Christ as they face the challenges this diversified life brings. We especially understand how the enemy attacks and distracts our young leaders in Christ as they strive towards completing their education to fulfill God’s plan for their lives. Continue to look for a new magazine each quarter and share with your friends and let them know we have a free resource that will help keep you grounded. Click the links below to see our featured edition and previous editions. To order 20 copies or more, click the button below. Growing Pains: A collection of stories written by teens learning how to trust Christ one day at a time. GACCS offers a number of services for both parents and teens. To find out more Click Here.